I am a huge fan of the Olympics. The day Olympic in Beijing began I cannot take my eyes off the TV watching my favorite athletes. My husband get annoyed at me one time because of the numerous recordings I did. Haha. Let me tell you, I am so crazy watching the Olympic especially the swimming category. 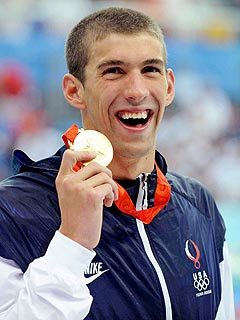 And Michael Phelps is one of my favorite swimmers. Hurray for him! He already won 3 golds and he is aiming for more golds! His 3rd gold win last Tuesday gave him his ninth career gold medal, tying legendary American athletes Carl Lewis (track and field) and Mark Spitz (swimming). He's an AMAZING swimmer! He is very inspiring and has good attitude. I'm glad he is representing the USA. he's so great. he's taking his place in Olumpic history for winning 3 gold medals! galing.